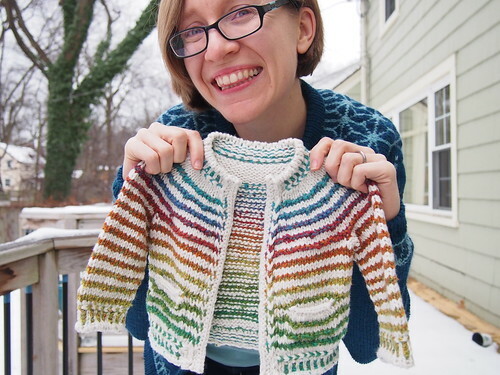 Things I knit for other people’s babies: babyStripes! I finished another yoke sweater around the same time as finishing Tensho. This one was just a WEE bit smaller! I’ve lost count of how many of these sweaters I’ve knit…this might be the fifth or sixth? In any case, I think it’s safe to say I’ve got the pattern pretty well worked-out for the smallest size! Though this one is unique, because it contains no wool. I really do want to actually write out this pattern – I just have to find the time. Madrigal is still wearing the Kid-size version (which I apparently never created a “finished object” post for on the blog, but you can see a finished photo of it at the bottom of this post)…in fact, she wore it on school picture retake day last week! I’ve also started adult-sized versions of this (like this one), but so far have been unsuccessful at actually completing one, because my toddler-parent brain wasn’t very good at counting. I think that’s less of a problem for me now, so maybe I’ll tackle a grown-up top-down Stripes! cardigan along with the baby and kids versions. You know, eventually. I’ve considered submitting these patterns to Knitty.com, because they seem like the sort of thing that would fit well there, but I also might just self-publish. Isn’t that a perfect little onesie for this nugget to receive from a psycholinguist academic auntie? Now I just need to figure out when I can get to the post office, because this little one is due any day now! (Mostly) Finished Object: Tensho Cardigan! That’s a great sweater! I totally want to knit one whenever the pattern appears. And that onesie is great too.